So, the question is, what is the general brake setup for tadpole trikes? Most are set up with one lever that works two brakes at the same time. There are lots of different styles, such as this one for example. You can see that it has 2 ferrules instead of 1, most commonly used on dual disc brakes. There are other models that differ somewhat visually but the idea is the same. 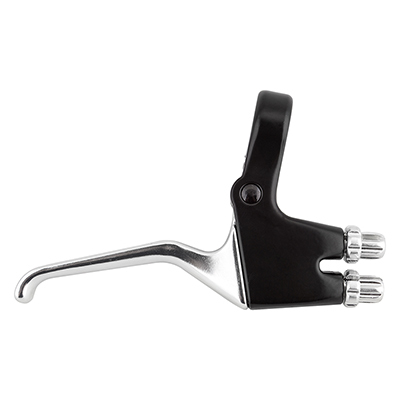 Many Trike levers also have a push button locking mechanism that functions like a parking brake so that it cant roll while engaged. Typically, you do not brake all three wheels of a recumbent tadpole trike, but only the front wheels, at least when the trike is in motion. Most high end tadpole recumbents use two brake levers which independently control the brakes on the corresponding front wheel. They may optionally have a third brake on the rear wheel which is used as an emergency or parking brake. The front brakes are controlled with brake levers on the handlebars of your trike. The left lever operates the brake on the left wheel, and the right lever operates the brake on the right wheel. 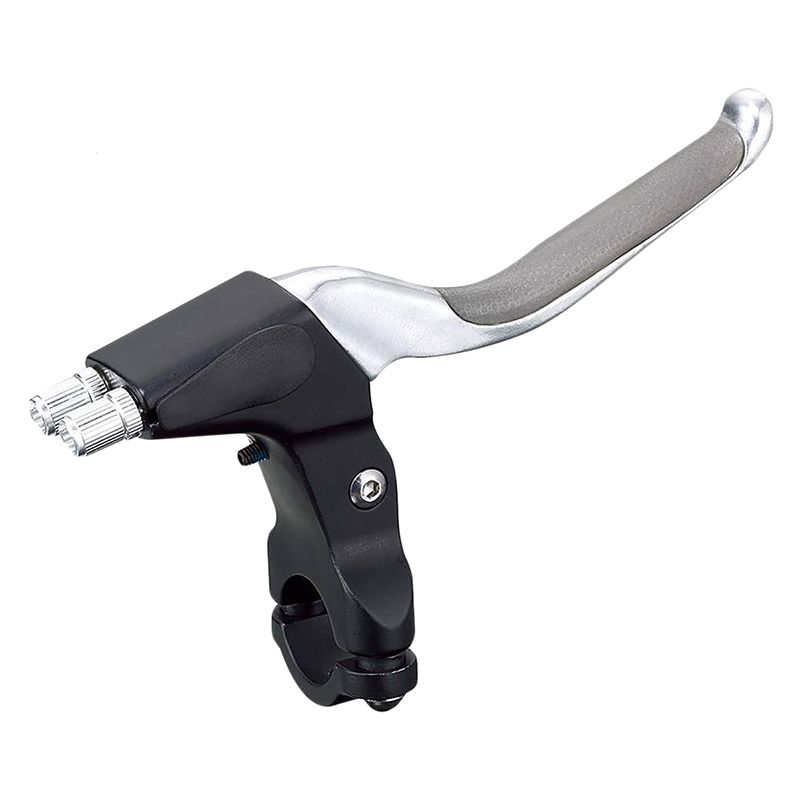 To brake, squeeze both brake levers at the same time with even pressure. Some specially adapted trikes may have a different lever setup. Catrike brakes work the same way. The Catrike has front brakes only, since in a breaking situation 90% of the weight is transferred to the front of the trike. The front brakes are also independent, meaning that you can break the right wheel only, or the left wheel only. Therefore, especially in high speed or downhill situations, it is mandatory that you pull both brakes at the same time and with the same intensity. If you elect however, to brake only with one brake, this could cause the trike to steer out of your path and cause serious injury or death. In the standard assembly, both front wheel brakes are operated separately: The left brake lever operates the left front brake, the right brake lever operates the right front brake. If your tricycle is equipped with a rear brake or a parking brake, use this brake only as an emergency brake in the unlikely event of a failure of the front brakes. Remember braking in a corner with only the inside brake will not slow you down as it is unweighted and will lock up. Try and use both brakes in an emergency situation. We have heard stories of people cornering at speed with their drink bottle in one hand, having to brake mid-corner, and finding they have very little brakes to slow them down. Even lower-end recumbent trikes use the same method. To stop, squeeze both brake levers smoothly and with equal pressure. Each brake lever activates the corresponding brake on the front wheels. You will experience brake steer if you brake with only one side or unevenly. It is possible to tip the trike forward by stopping too fast. I have actually seen a single lever which controls both brakes, only on one line of tadpole trikes: the Windcheetah line. These use a control yoke for steering, rather than handlebars, and as a consequence must have only one brake lever. And you'll see these on velomobiles which also use a steering yoke. Not the answer you're looking for? Browse other questions tagged brakes recumbent tricycle or ask your own question.